If there is one thing therapists have in common, it is the desire to make a difference in people’s lives. This goes especially for those specializing in occupational therapy, physical therapy, or speech-language pathology. But what happens when the job you find yourself in does not match your career aspirations? Is it time to move on, or should you tough it out? Ask: Does your current job have the right focus? Chances are that you entered this career path because you wanted to work with people and make their lives better. If you feel your workplace has lost sight of that, it’s time to find one that hasn’t. When your workplace shares the same focus you do, you will find it much easier to put up with the tougher aspects of the job, not to mention that you will feel like you are making a true difference. Reflect: What do you want to see out of your practice? Do you prefer seeing many people for a short time, or fewer people regularly? 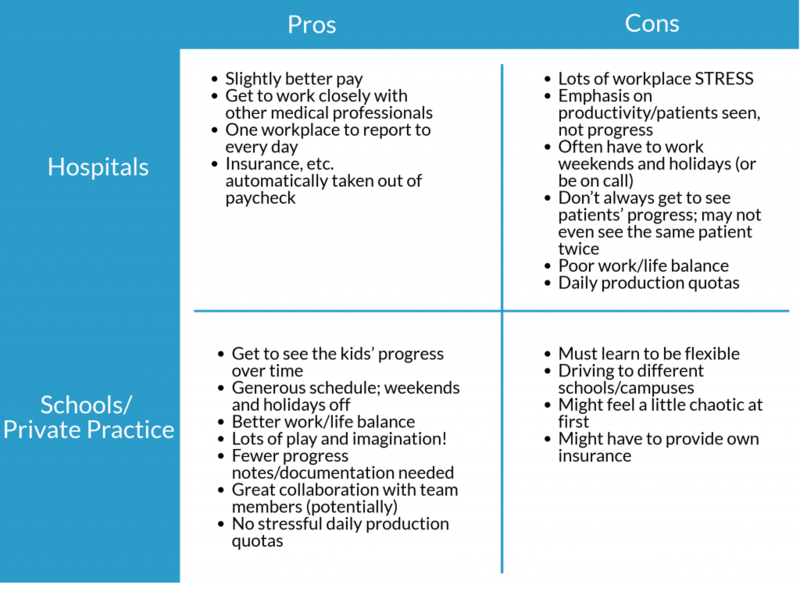 Do you prefer a single workplace with a rigid schedule, or a more flexible practice? Do you find comfort in frequently filling out reports, or would you rather focus on building relationships? Different settings will make different demands on you and your time; in order to compare them and look for the right kinds of jobs, you should be clear about what the ideal setting would look like. For example: One advantage that working in, say, a school setting has over a hospital setting is that you can build rapport with kids and see progress being made over time. This is the kind of intangible benefit that is not reflected in a paycheck, and that could make what you do seem so much more worthwhile. List out the benefits of staying vs. switching. Most folks make important life decisions based largely on emotion. You shouldn’t discount your feelings, of course…but it pays to take a rational, organized approach as well. Of course, some of these might matter more than others. You will have to figure out for yourself which pros and cons weigh more heavily. Listing them out is an important first step that will help provide you with clarity. Talk to other therapists and/or shadow. If a switch is feeling more and more appealing, do your research by seeking out other therapists in other settings. (We would be glad to pair you with a therapist working in a school setting; just contact us.) At the very least, you should have a conversation and ask questions. Even better, see if you can shadow someone to observe what a typical day is like. If a switch is feeling more and more appealing, start looking for opportunities in your area. Sometimes, finding a great company to work for can be the deciding factor! What kind of initial training does the employer provide? Do they have experience helping therapists transition from a hospital setting? What kind of ongoing training is available? What other kinds of support are provided? Will you be able to deduct or be reimbursed for things like mileage and time spent at home processing paperwork? How often do you have to report? What’s involved? Do you have the option of speaking with another therapist to get a feel for the setting? Or better yet, shadowing someone? Take the leap and start applying. Remember, you are leaving your old job for a reason. You will want to make sure that your new job provides what you are looking for in a work situation. 8. Get your fear in check. Maybe it’s cliché, but it’s also true: Change is scary. Changing jobs is very scary, and changing the kind of job you have is even scarier. This is, after all, your way of supporting yourself. But don’t let that fear keep you from being happy in your job. If you truly dislike your current position, the toll it will take on you—and the people you serve—is not worth the extra little bit of security you get by sticking with the status quo. Our company has had many physical therapists, occupational therapists, and speech-language pathologist come from hospital settings. Every one of them has felt that the transition was worth it. Yes, there were some adjustments that needed to occur; but all of them have said how great it was to get to know their kids and families, forge relationships, and know that they are truly playing an important and meaningful role in these kids’ lives. Ready for a change? Ozark Therapy is currently hiring. Send your resume to danmccool@ozarktherapy.com.